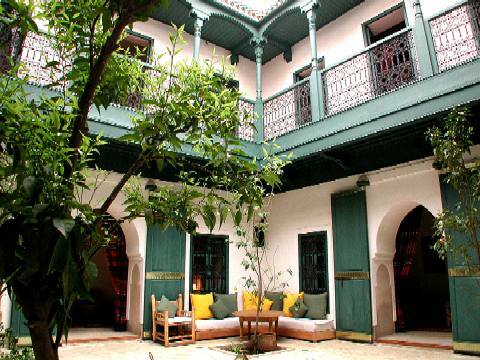 Experience the tradition of a Moroccan riad in the historic heart of the medina. Exclusive occupancy for groups of 2 to 12 persons with services, cook, hammam, jacuzzi. The riad JMYA is a large house with a principal residence and adjoining apartment or "Douiria". Both have been renovated using traditional materials to restore the original architecture. The main courtyard is planted with citrus trees and features a Moroccan fountain with jacuzzi. The courtyard,surrounded by a carved wooden balcony, offers cool temperatures in summer, while the warm winter weather can be enjoyed on the roof terrace. You can relax in the Moroccan jacuzzi or try the traditional “hammam” to experience the daily routine of the “Marrakchis”. The principal residence can accommodate 8 people in four double rooms, each with private bathroom. Dar Chemaa is the "douiria" or an apartment where the family welcomed house guests in the past. This independent apartment is linked to the main riad Jmya through two double doors. This is a typical lay-out for large houses in Marrakech. The Douiria has its own kitchen and courtyard with ornamental fountain. It offers accommodation for up to 4 people with 2 double rooms and one shared bathroom. The roof terrace provides an ideal facility for sun bathing or relaxing in the shade. The housekeeper is at your service to prepare a variety of meals from a wide choice of menus. You can shop for food and drinks yourself or the housekeeper will be pleased to help.